Most homeowners are comfortable changing a light bulb, a fuse, maybe even a socket, but it can be tempting to bite off more than you can chew in order to save money. Knowing when to call in the electrician in London is key to maintaining a safe home. The introduction of Part P in 2005 made things a little more difficult for the average homeowner. Suddenly there were a raft of new rules on what a DIY’er could and could not do. Electricians in London all rushed to become Part P certified, myself included, and confusion reigned for a while. Part P actually refers to “Approved Document P” of the electrical safety guidelines. This is part of the updated building regulations brought in by the government over recent years. Fortunately all that has died down and things have gained something of an equilibrium. Essentially, if you are repairing, replacing or adding electrical appliances to an existing electrical circuit, you can safely do it yourself if you know how. There are certain exclusions for kitchens and bathrooms, that aren’t exactly straightforward, but a qualified electrician in London from My London Builders can help there. 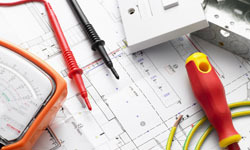 For example, replacing a light fitting, immersion heater, damaged socket or switch, adding or replacing a cooker, or connecting a storage heater to existing wiring is a suitable task for someone with the knowledge to carry out the work. Adding a spur to a circuit, lighting points, adding sockets, upgrading consumer units, rewiring, installing under floor heating or replacing a shower will need a certified electrician with the Part P qualification. That’s when you would call My London Builders. The idea of Part P is not to freeze out otherwise qualified or able people from doing the work, but to encourage everyone to use professionals. Electrical faults, poor installations, or worn wiring cause more fires than almost anything else in the home. The purpose of Part P is to ensure everyone who deals with these things is capable of working safely. It is an attempt by the government to provide tighter regulation of the building and electrics industry and to give a minimum benchmark for electricians to meet before being able to trade. It is partly to weed out the cowboys, and partly to reduce death and injury from poor electrics. If you’re unsure of when to hire an electrician in London, consider the jobs listed above and use common sense. If you know about electrics and are doing a job that isn’t covered by Part P, then it is probably safe for you to do the work yourself. However, if you’re unsure of what you’re doing, don’t want to play around with electrics or want work done that the new regulations cover, it’s time to call that electrician. My London Builders have Part P qualified electricians in London and the South-East. We are experienced, qualified and insured to do the job. It’s what we do and we’re very good at it. If you’re looking for electricians in London, give us a call, we’ll be happy to help.